On July 19, the Administrative Court held a regular hearing on the case of Public Information and Need of Knowledge (Pink Armenia) NGO against the Ministry of Culture, which was presided by Judge Rafik Khandanyan. In 2017 Pink Armenia has appealed to the Ministry of Culture to accept advertising to promote tolerance towards LGBT people as social. The ministry refused, saying that ads do not have a public importance, that the public is aware of the existence of people with “non-traditional” sexual orientation, so there is no need to advertise it, and that advertisement contains the Internet address and QR code of the organization. Pink Armenia representative Hasmik Petrosyan presented to the court a series of reports and studies on the unfavorable situation of LGBT people in Armenia to prove that the issue is of public importance. Examples of advertising campaigns in other countries were presented to the court. Petrosyan pointed out that the argument the Ministry present to refuse accepting advertisements as social, because they are not related to an issue of public importance, shows that the Ministry does not control the situation. The ads were not meant to show that there are sexual minorities, but to develop tolerance towards these groups. Petrosyan also added that Pink Armenia has tried several times to meet with the Ministry of Culture to raise awareness about the problems of LGBT people, but has not received any response. 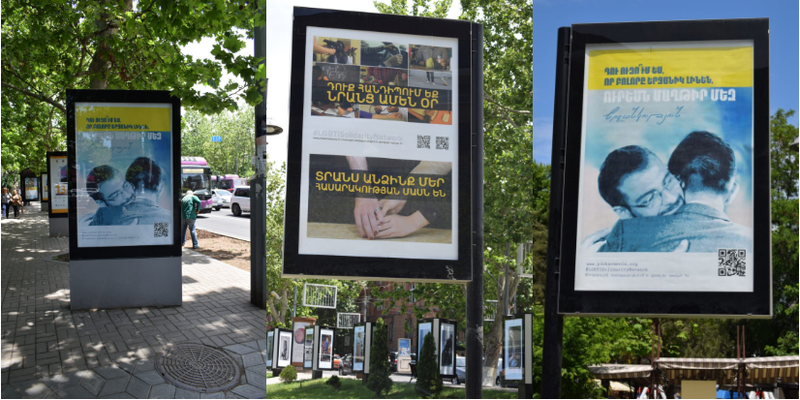 Representative of the Ministry of Culture Anush Ghazaryan, who is also the Head of the Legal Department of the Ministry, reaffirmed the view that if the advertisement contains the client’s address and QR code, it can not be recognized as social, noting that the ads were aimed not to raise a particular social issue, but to advertise these organizations. Hasmik Petrosyan responded that the law does not prohibit the inclusion of contact information in social advertising. Ghazaryan also said that although they did not address the content of the ads, these ads may distort the teenagers. To this, Judge Khandanyan respond by asking whether they had done any research and found out proof. Ghazaryan did not refer to any research. Pink Armenia, with this lawsuit against the Ministry of Culture, tries to oblige them to refrain from discrimination and recognize the posters submitted to the Ministry to as social advertisement. The hearing was postponed until October 3, for the preparation of speeches.